Unter dem Titel "El-Sidecar" hat der Spanier Javier Mariscal eine Comic-Staffel herausgegeben. Mariscal hat übrigens auch das Olympia -Maskottchen für die Spiele in Barcelona entworfen, ist also kein "unbekannter". Javier Mariscal attended the Graphic School in Barcelona. 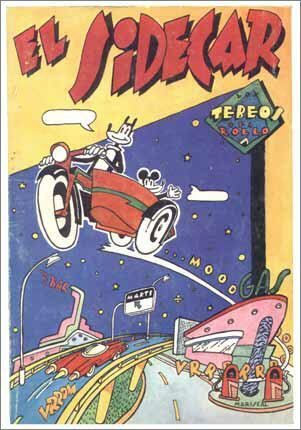 In 1973 he co-published the underground comic 'El Rollo Enmascadero', with Nazario, Farriol, Roger, Pamies, Max and Montesol. 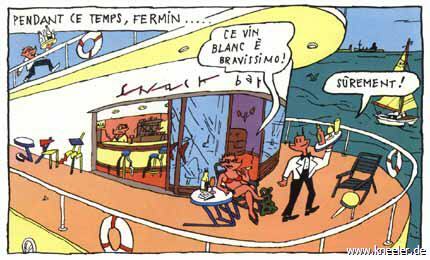 His comic work has been published in the periodicals 'Paupérrimus', 'Purita', 'Star', 'Grandes Hombres', 'El Sidecar' and 'Art Dégénéré'. He developed himself as a multi-faceted artist, doing paintings, making ceramics, designing furniture, decorating bars and painting kitchen interiors. In 1988, he designed 'Cobi', the mascot for the Olympic Games in Barcelona. This is one of my favorites. The topic of sidecars came up when I was playing a little super empire strikes back for the SNES home entertainment system over at the house of SAC. Kurt, Bryan and I were on the Cloud city level, or rather, the level where you approach cloud city. In this level you have to fight against those odd red fighter planes they have at cloud city, it's useless to describe them, you either know what I'm talking about or you don't. In this level, you move closer to cloud city by killing these ships... even if you fly in the opposite direction the whole time, after killing 15 ships you'll be at cloud city. Likewise, you can fly straight at the damn thing all day, but unless you kill those ships, you won't be even an inch closer when the sun goes down. This led us to postulate at length about the existence of "deathclidean space", in which your position is determined how many people you've killed. But I digress. Getting back to the point, I opined that the aforementioned ships look like two sidecars connected to each other. We theorized that this was how they flew: by harnessing the force of the shifting position of dominance between the two- which one is the other's sidecar? Anyway, so I wrote this comic about sidecars' sidecars.